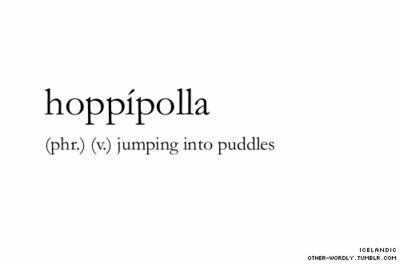 I like this word, hoppipolla. It sounds fun popping from the lips. Try it? See! Awesome! This is something I am usually guilty of. Unless there’s somewhere I have to be where staying clean and dry is required, I’ll jump in the puddle. I don’t require children to be present to encourage me either. My parents have a couple of acres around their home, and in the very back there’s a pond in the spring and fall (usually it dries up in the summer, but there’s been a lot of rain this year. It might still be there.) A couple of months ago, my nephew and a friend got geared up (yep, required when the pasture is overgrown) and went exploring. When they returned my nephew chattered on about a pond, and an island in the middle of the pond. That’s when I believe my mother lost it. I didn’t get to witness it, but I can make an educated guess. This is not the first time a 14-year-old, living in her home has made such a statement. Last time, it ended up with me commandeering an old cooler to become my “boat” and sailing for that island. All was well, until my “boat” drifted off…I was stranded on an island. Not quite a desert island, but I was wishing for rope or string or even a twisty tie to keep the “boat” with me…or galoshes. Galoshes would have been nice. The pond wasn’t deep, but I had (once again) received a lecture about getting muddy and wet in the pasture. Plus, it was kind of cold out. I could tell the water wasn’t going to be nice and warm. Fortunately, I was rescued by my dad, who really couldn’t understand why I didn’t just walk out. What can I say? Piggyback rides are fun! This entry was posted on Thursday, July 2nd, 2015 at 3:32 pm	and tagged with Childlike Fun, Fun Words, I'm in trouble again, Puddles, Seductive Vocabulary, Words to Live By, Wordy Thursday and posted in The Seductive Power of a Decent Vocabulary, Words to Live By. You can follow any responses to this entry through the RSS 2.0 feed.